Universal should find plenty of holiday cheer with It’s Complicated, a smart, sophisticated and downright hilarious comedy. Movies don’t get any funnier than this—at least the ones made for thinking adults. 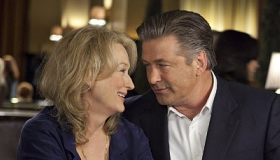 Meryl Streep keeps her remarkable string of comic hits going, here playing a divorced woman in her 60s who suddenly finds herself playing the part of the ‘other woman’ in a clandestine affair with her ex who’s now married to a much younger bimbo. The clever premise will certainly draw women, but guys will like it too because there are so many laugh out loud moments. You’ll probably want to see it again just to hear all the dialogue. Expect solid box office returns for this Christmas Day release that should kick in even higher once word of mouth spreads among the grown ups to whom it’s aimed. Arguably writer/producer/director Nancy Meyer’s best yet, the filmmaker doesn’t stray too far from what made previous holiday hits like Something’s Gotta Give and What Women Want work so well. This time she’s pulled off a clever premise involving Jane (Streep), a woman long divorced and now happy to run her bakery/restaurant. Things get complicated when, during a weekend trip out of town for their son’s graduation, Jane and her ex, Jake (Alec Baldwin), find themselves rekindling the sparks of their marriage even though he had left her for a much younger woman, Agness (Lake Bell). Although she resists, they are drawn together like magnets for a secret affair when it’s clear Jake longs for more mature companionship than he has at home. Further complicating matters is Jane’s burgeoning relationship with an architect, Adam (Steve Martin), whom she’s hired to remodel her kitchen. Adam falls hard for her but soon realizes he’s gotten into more than he bargained for. Although the film’s classic comedic structure doesn’t offer any astounding surprises in the development of the twisted romantic quadrangle, there are numerous pleasures to be found in Meyer’s sharp script and sterling cast. After a string of box office smashes including The Devil Wears Prada, Mamma Mia and Julie & Julia, Streep continues to astound in the rare full bodied roles written for a woman over 50. She’s radiant onscreen and wonderfully adept at comedy, which she proves in a laugh-out-loud scene smoking pot with Martin. He, by the way, is completely engaging and likeable and plays Adam in an effective lower key. Baldwin is just great, stealing every scene he’s in and clearly showing his Emmy winning sitcom work on 30 Rock has helped develop his comic chops. Bell is mainly left with scraps playing the stereotypical annoying young wife, while John Krasinski (The Office) gets a lot of mileage out of mugging. As in most Meyers movies the upscale lifestyle is a splendid pleasure to behold with beautiful people, tranquil locations and a stunningly appointed home. Meyers must be an interior designer at heart. More importantly she goes for the laughs in a bigger way than ever before and succeeds so brilliantly the holiday haul should be plentiful. It’s the comedy treat of the season. Rating: R for some drug content and sexuality.